Tomorrow evening we have the pleasure of welcoming Marc Barriot of Clot de L’Origine to the shop for a special visit as he is traveling through California. 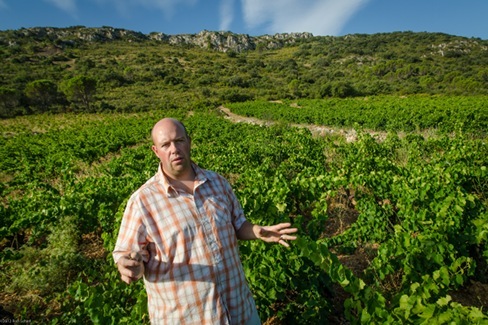 Marc plys his trade in the Mediterranean-kissed Roussillon of southern France where he works with local varieties best suited for the region such as Carignan and Macabeu. He started his domaine about 14 years ago and all the vineyard work is done by hand or by horse, plus not surprisingly Marc ascribes to the holistic farming practices of biodynamics. His work in the cellar is similarly in tune with the natural order of things, and he guides his wines without chemicals or manipulations and with either no or low sulphite addition. We will be pouring a couple of Marc’s wines tomorrow, and he will be joining us at 6pm (not our usual 5pm start time) so come on by to say hello and drink some wine and start your week off right.